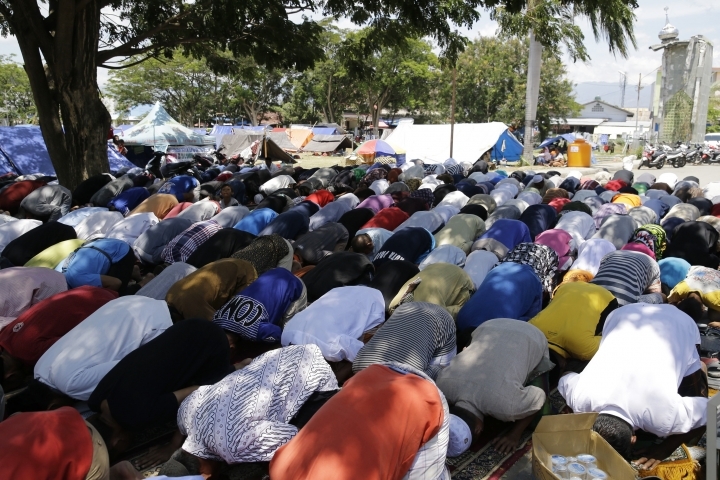 PALU, Indonesia — As the sun slipped behind the mountains and a gentle breeze blew onshore, hundreds of people gathered on an Indonesian beach Friday to chant a Muslim prayer — and remember those they lost — one week after a massive earthquake and tsunami ravaged the area, killing more than 1,500 people. One woman wiped tears from her eyes while mouthing the words as the voices rang out in unison. Another rocked quietly behind her on the same sand where a festival with hundreds of people was being held when the disaster struck. 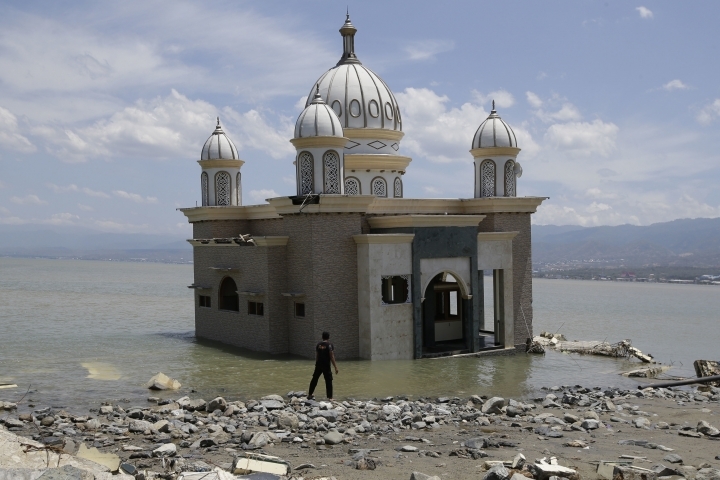 The chanting marked the end of a day filled with prayers and more burials as many survivors leaned on their faith to help them overcome grief and confusion. 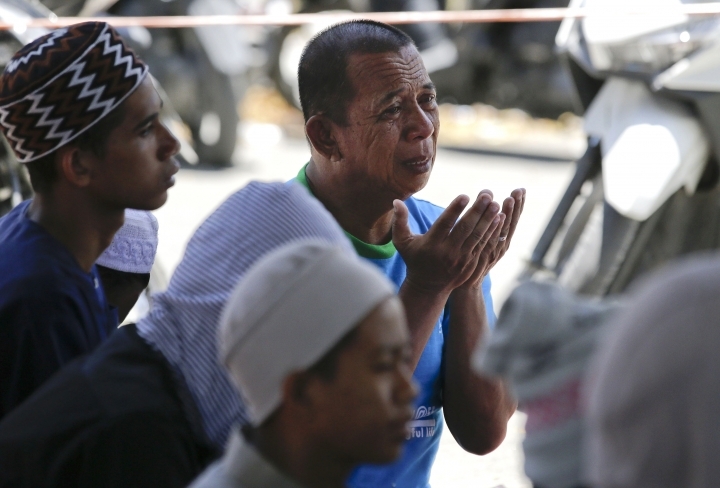 "I hope my dead son has gone to heaven because he was in the middle of praying," said Abu Shamsuddin, who attended Friday prayers in the afternoon outside the damaged Agung Mosque in Palu city. "Allah willing, heaven for him. I have faith in that." 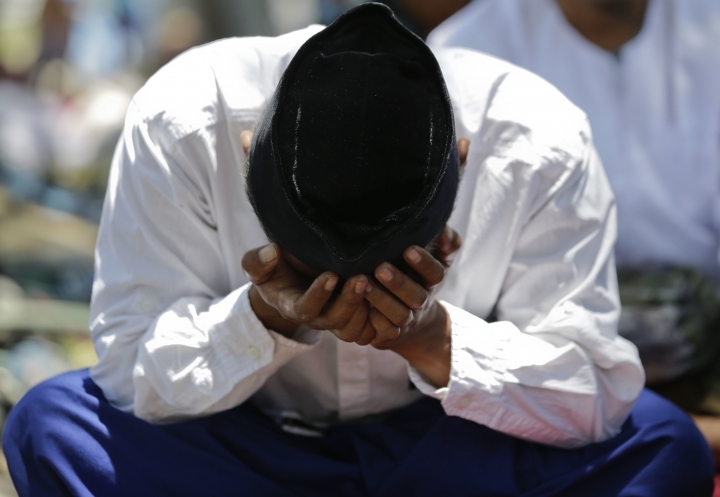 Men with skull caps sat on prayer mats in an open field, some weeping openly. 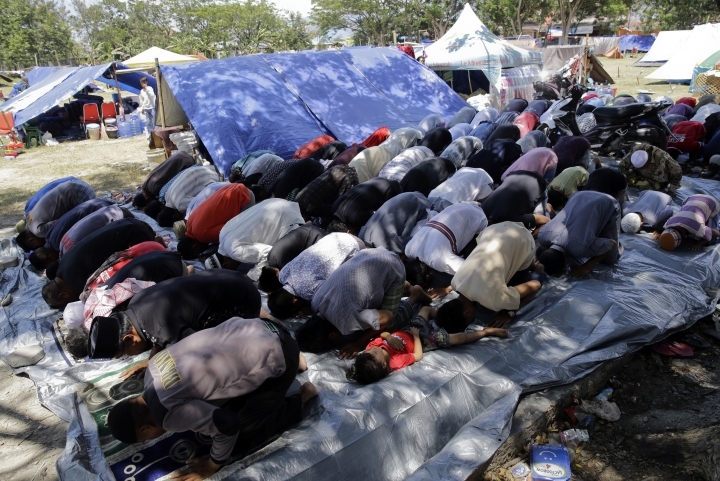 Others braved the scorching sun as they listened to the mosque's imam encouraging them to be courageous. 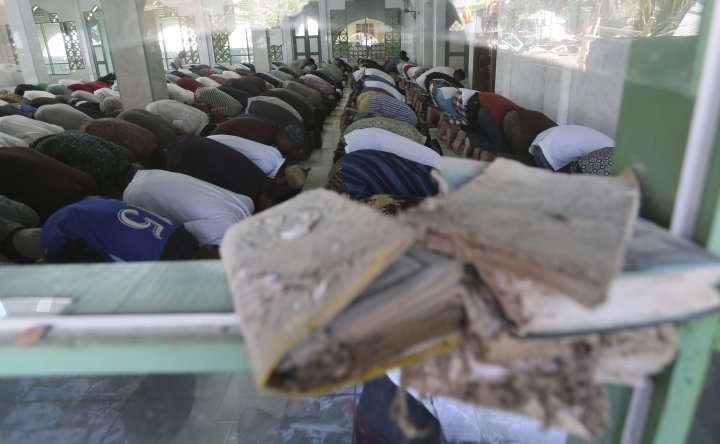 The national disaster agency said the confirmed death toll from last Friday's magnitude 7.5 earthquake increased slightly to 1,571. 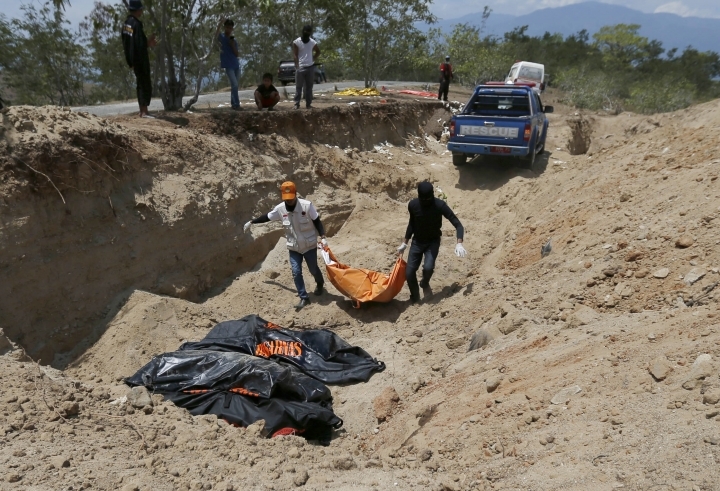 Six more victims were buried Friday in a mass grave, bringing the total to 643. 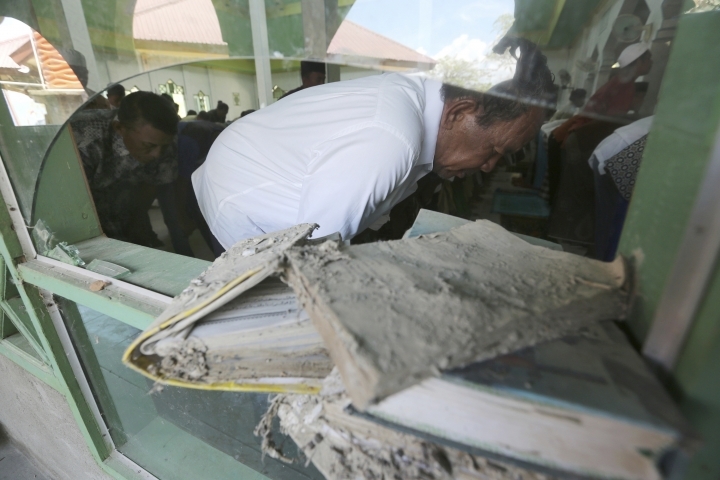 Disaster agency spokesman Sutopo Purwo Nugroho said in a briefing in Jakarta that the search will continue for hundreds still missing, including many buried in deep mud and debris from collapsed houses and buildings. 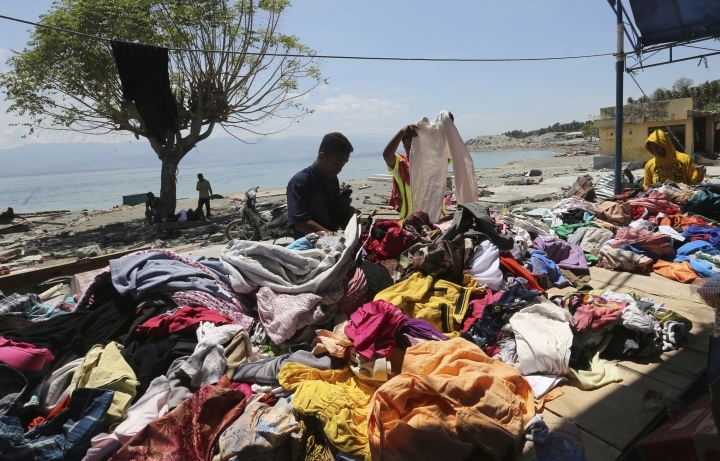 Frustrated French rescuers resumed their search at the Mercure Hotel in Palu on Friday but failed to detect the possible sign of life that was picked up by their sensors a day earlier. The equipment can identify breathing and heartbeats, but gas leaks and other factors can result in false positives. "We are perplexed and frustrated mostly. We strongly believed in it yesterday. Now we have nothing at all. ... We tried everything and have no response," said Philippe Besson, president of the International Emergency Firefighters team. Local rescuers continued to dig at the collapsed four-star hotel. The French rescuers said on their Facebook page that 40 people, including six workers, were still missing there. But some residents refused to give up hope. 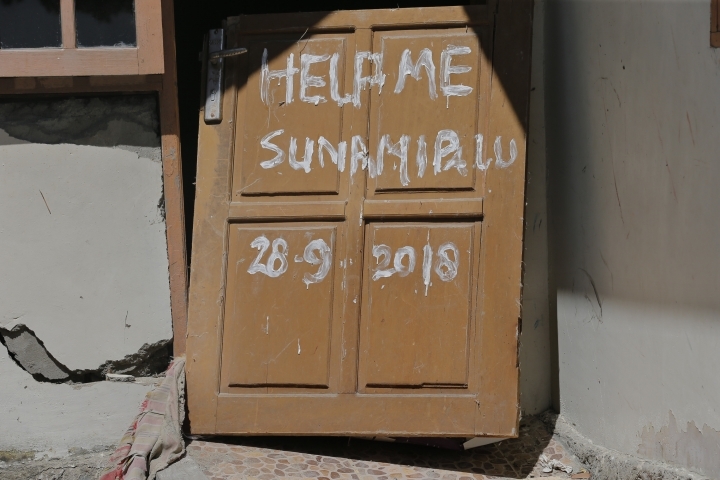 "I am hoping for a miracle," said Bambang, who has been searching daily at the hotel site for his pregnant wife. 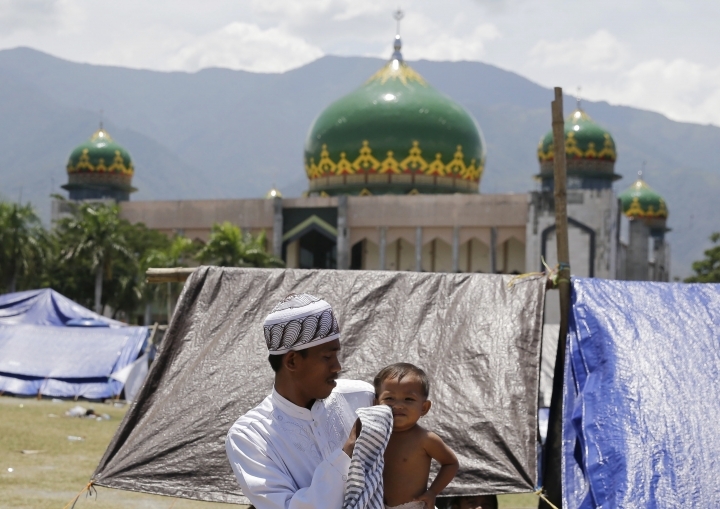 Thousands of others were injured and more than 70,000 people have been moved to shelters and makeshift tents that have sprouted across Palu, the provincial capital that's home to 380,000 people, and its surrounding areas. 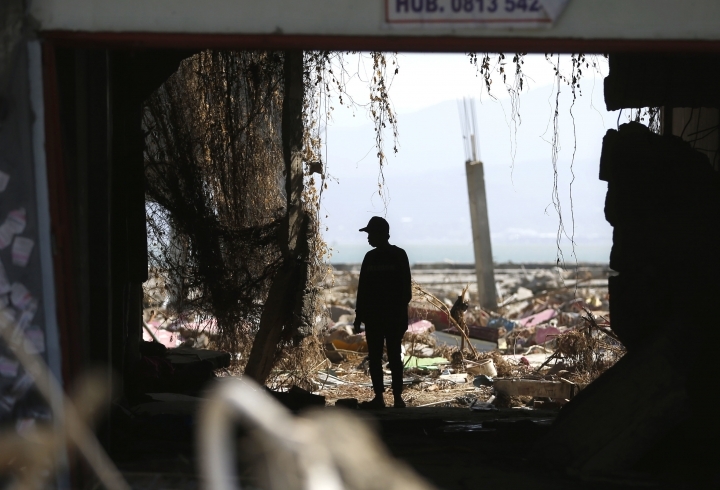 After days of initial chaos and looting by desperate survivors, some stability has returned to Palu, with shops slowly reopening and electricity restored in some parts of the city. 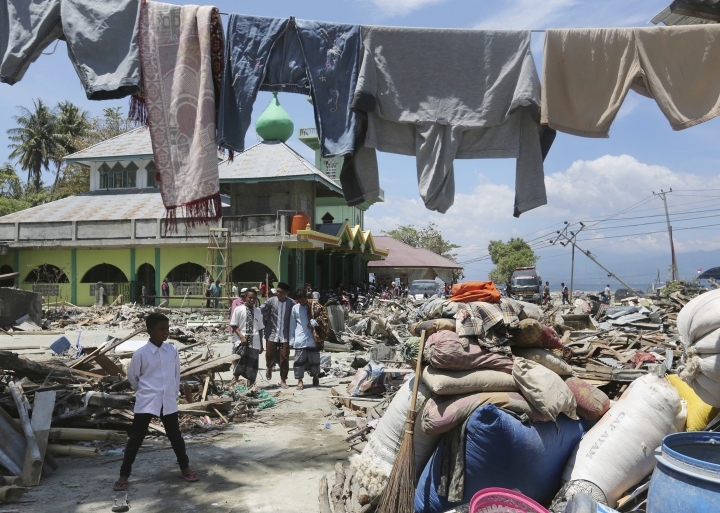 Nugroho said about 67,000 military and police have been deployed to the area to maintain security and accelerate distribution of aid to survivors in outlying areas. 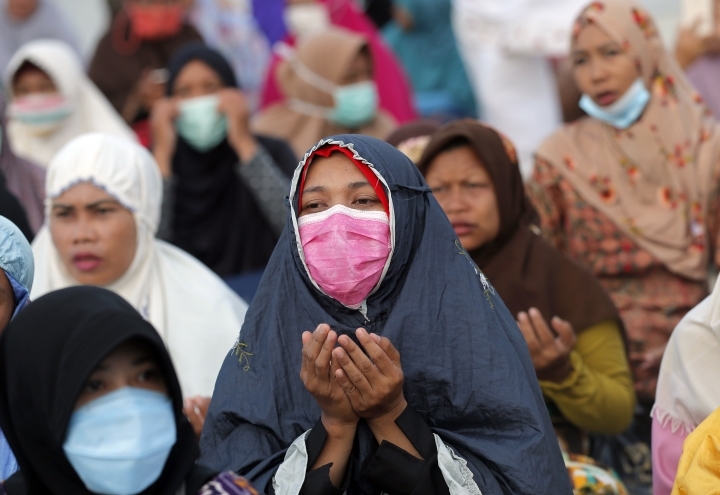 Ships and more than two dozen military transport planes, including ones from Japan, New Zealand and India, have arrived in Palu carrying hundreds of tons of food and badly needed supplies and heavy equipment. Television footage showed personnel loading boxes of food into trucks that will be delivered to outlying areas, where many evacuees are still complaining that aid has been slow to arrive. Officials have listed tents, water treatment equipment, electric generators and disinfectants to fog campsite areas to prevent disease as immediate needs. He said the government will ensure that affected children return to school within a month. The United Nations has said some 200,000 people, including tens of thousands of children, are in need of help. International volunteers said many camps lack adequate sanitation, sparking fears of the spread of disease. Fuel remained another concern, with villagers forced to queue at pumps for more than six hours. Many villagers remained traumatized as aftershocks continued to jolt the region. 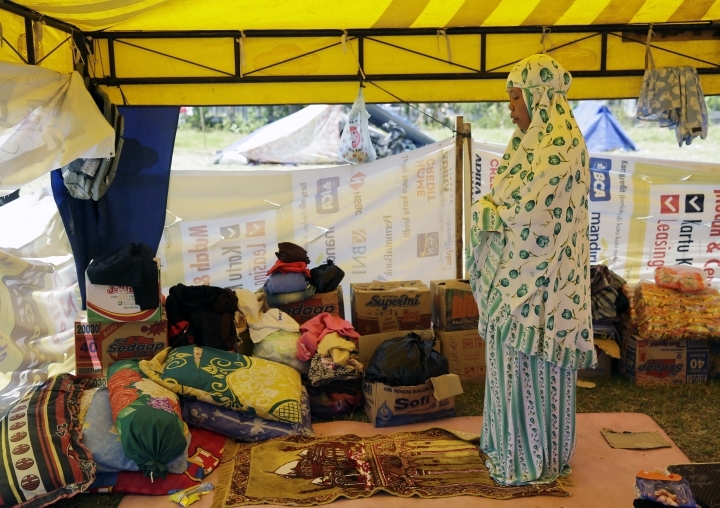 "I grabbed my children and fled to the hills when the earthquake happened. I didn't manage to take any valuables but we are alive and that's most important," Yuli, who goes by one name, said on local television. "I don't want to ever go back to the village. It's too terrifying."